A 9-year-old bat boy died Sunday evening after getting hit in the head as a baseball player took practice swings in Kansas, his team said. 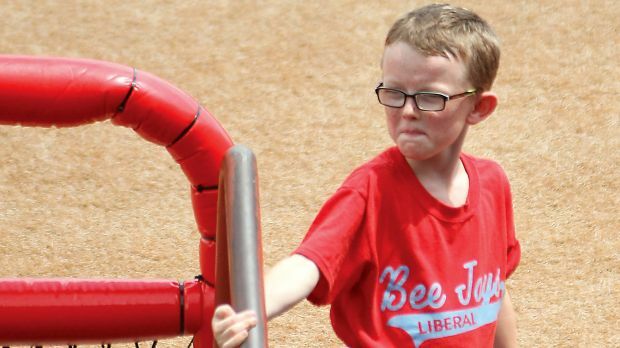 "Kaiser was simply doing something he loved"
"With the permission of the family, and with much sorrow and a very broken heart, I regretfully inform everyone that Kaiser Carlile passed away earlier this evening," the Liberal Bee Jays, an amateur baseball team, announced on Facebook. Carlile had been in critical condition since being struck by a bat while wearing a helmet during a game against the San Diego Waves in Wichita Saturday afternoon. A witness told NBC affiliate KSNW that the boy was running to bring back a bat after an out when he was hit by a batter taking a practice swing. "The bat boy retrieved the other bat and he just ran right by him, and he was swinging, and it hit him in the helmet," Jim Parks told the station. An umpire started giving first aid until first responders arrived. A photo posted by a local sports writer showed Bee Jays players huddled in prayer after learning the news of Carlile's death. Carlile had been a bat boy for most of the team's season. In a statement released early Monday, National Baseball Congress General Manager Kevin Jenks said: "it's difficult to remember a day that is darker than this one. Sometimes life doesn't make sense and this accident certainly is a memorable example. Kaiser was simply doing something he loved."